penalty was the volume required for the fractionating separator. For hydrogen-fueled hypersonic and space launchers, volume is a critical parameter, and increasing it comes at a significant size and weight penalty. At takeoff this propulsion strategy can significantly reduce the takeoff perceived noise. It is done for the same reasons a conventional mixed flow by-pass gas turbine was invented. ACES was originally proposed by the Air Force Aero-Propulsion Laboratory for the space plane of the late 1950s [Leingang, 1988; Maurice et al., 1992]. and was the subject of intense investigation in the 1960 to 1967 time period [Leingang et al., 1992]. Most of the original Air Force work was for a TSTO vehicle, although application to SSTO was investigated. For airbreather operation to the 12,000 to 14,000 ft/s range, its cycle can achieve weight ratios less than 3 with oxygen-to-fuel ratios approaching one-half. 11. ACES-deeply cooled ejector ram-scramjet-rocket. Figure 4.22. is an ACES option added to Propulsion System 7. Even in the 1950s, the paramagnetic properties of liquid oxygen were noted by the LACE and ACES investigators [Leingang, 1991]. Patrick Hendrick was a graduate student under the late Jean Vandenkerc-khove in 1988 who observed that Siemens sold an exhaust gas analyzer measuring gaseous oxygen based on the magnetic properties of oxygen. The magnetic susceptibility of oxygen at its boiling point (90.03 K) is 7699 x 10~6 in cgs units, that is, as large as some chromium and nickel compounds. During a visit to Jean Vandenkerc-khove at his Brussels residence, Patrick Hendrick [Hendrick, 1996] discussed his concept of gaseous air separation using the magnetic properties of oxygen. Collaboration with Vladimir V. Baliepin resulted in the addition of a vortex tube pre-separator based on the small temperature difference in the liquid temperature of nitrogen and oxygen. The result was a new approach to the ACES concept with much lower total volume requirements than the liquid fractionating equipment. The deeply cooled gaseous air is not pumped to the rocket immediately, but passed first through a vortex tube initial separator (at this stage the LEA contains about 50% oxygen) [Lee et al., 2003], and then into a cryogenic magnetic oxygen separator. 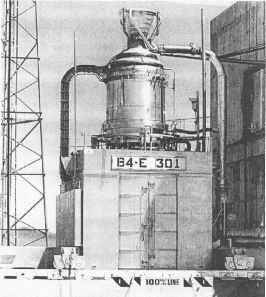 The oxygen component is then liquefied as LEA (LEA contains 80% to 90% oxygen) and stored for use in the rocket ascent portion of the flight. The gaseous nitrogen component of oxygen- poor air (OPA) contains from 2% to 5% oxygen. The oxygen-poor nitrogen component is injected into the ramjet, to create a hypersonic by-pass engine that increases engine mass flow, thrust and reduce the mass-averaged exhaust velocity. At takeoff this can significantly reduce takeoff noise, for the same reasons a conventional mixed flow by-pass gas turbine was invented. This system is in laboratory testing and studies but has not as yet been developed as propulsion hardware. At this point in time it has potential to significantly reduce the volume and weight required for an ACES system, but is not yet proven. For airbreather operation to the 12,000 to 14,000 ft/s range, this cycle can achieve weight ratios less than 3 with oxygen to fuel ratios approaching one-half.